Seeing you children eat 100% organic food at the school canteen is the dream of many parents, but in the little Breton village of Langouët (20km NW of Rennes and about 200km west of Roscoff), that dream has been a reality for the last decade and it was, they say, the first commune in France to make this bold leap forward. 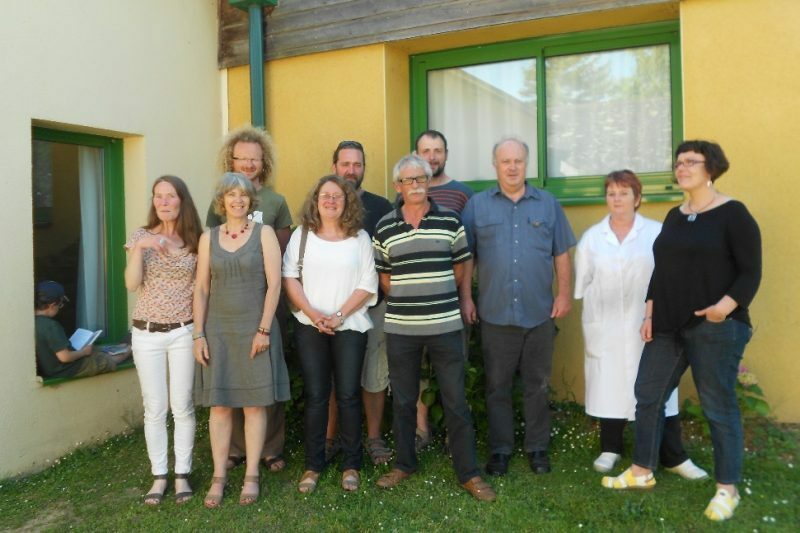 What is even more impressive is that in so doing, the village of 500+ souls in the Ille-et Vilaine department has actually brought down the cost price of the meals and has doubled the numbers using its canteen, while giving employment to a local organic agri-food supplier. “On the 5th of January 2004, the children came back from holidays and from that point on, everything was organic… The organic notion at that time made a lot of people nervous; people got confused between vegetarian an organic, which they both associated with food that wasn’t good and that tasted bad,” recalls Daniel Cueff (pictured above, third from right, in blue), mayor of Langouët since 1999. The first step was to find a reliable supplier(s) of organic food. A local collective known as Manger bio 35 had just started to supply small associations and companies in the area with products that couldn’t be otherwise sourced locally – such as rice, cereals and fish. “I remember the fear that I had when the mayor rang me up in the autumn of 2003 because I wondered if we would be able to handle all the logistics involved and if we could manage to make people even like the food!” So says Sophie Jeannin, from the local suppliers. The problem was to be able to convert the cook in the school canteen at first. She had been working there for several decades and had her own long-established habits and views on food. “We had to make her understand that I couldn’t sell her tomatoes in the month of December,” explains Mme Jeannin. 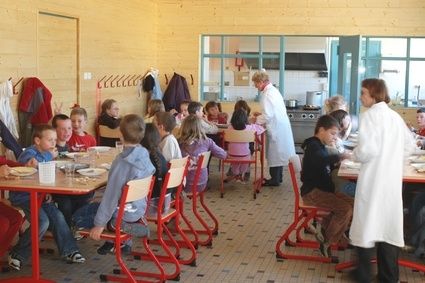 “What we had to avoid absolutely was the kind of message that said the children were fed healthily at school and given any old rubbish at home… You have to very careful when you’re acting in an ecological role, that you aren’t seen to be preaching to people,” emphasises the mayor, who is also a regional councillor as an independent Breton ecologist. “For us, it was one of the main factors in our decision to come and live in Langouët: healthy food but also locally-sourced food,” says Stéphane Pennanguer, a representative of pupils’ parents and father of two children aged 3 and 8. The number of children regularly eating in the school canteen went from 35 in 2004 to a figure of 80 today. And as the years went on, there was a surprise bonus to this success story: even though the mayor had set aside a supplementary budget to meet the expected additional cost of moving to organic food, the cost of the meal came down instead. “11 years ago when we were working on a conventional cuisine, the cost of each meal was €5 for the town and one decade later, even after taking on an additional staff member, we’re at exactly the same price per meal. Over the same period, the number of producers in the Manger bio 35 collective “has little more than doubled and the overall turnover has increased seven-fold,” says Mme Jeannin. Yesterday was the big rentrée for the primary schoolchildren of Langouët; their first day back. On the menu: sardine rillettes, vegetable ravioli with grated gruyère, apple compote with dry cakes. All of it freshly prepared just like Maman used to make in the traditional French home, but in school.